– Learn to forge a knife in this two day, blacksmithing centered, knife making class! The first day, you will start on the forge and anvil where you’ll be shown how to shape a knife blank with the hammer and anvil. 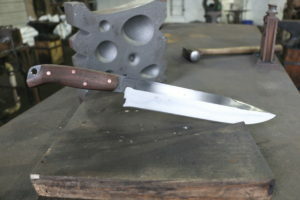 The second day will be spent shaping and honing the knife blank on knife grinders into a sharpened tool. You will be provided with oak or walnut handle scales and copper pins to complete your knife. The goal is for you to leave with a finished, working knife. This is NOT an ABS class. Please Note: This course is only open to students 18 years +. No minors will be allowed to participate in the course. IDs may be required for our younger looking participants. Registration is complete when the payment is complete. We will contact you with information about what to wear and how to get into the industrial complex with the email you provide. We are not responsible for you not entering your email address correctly.